Before the 2015-16 season had started, the Portland Trail Blazers lost eight players from their roster the year before — including four of their starters. The only remaining resemblance of a basketball player that they had was a volume shooting, overconfident basketball player named Damian Lillard. He was talented, but only on one side of the floor. As great as he was at putting the ball in the basket, the general public could easily describe his defense as, uhm, Harden-esque. He never showed the maturity, mental capacity, or leadership to dominate a league full of other great point guards in a way that helped his team win. To me, he was just another above average point guard in a league that had plenty of good ones. After the All-Star break, Lillard literally turned into a basketball magician and was capable of doing anything he wanted once he laced up his signature Adidas shoes. In half of an NBA season he convinced me that he’s worthy of an All-NBA selection, was a top four point guard in the NBA, and would have been an MVP candidate if he had the same success over the entire season instead of half. I began to watch Lillard more and more. I watched him play many times before, but I began to watch him even closely. His offensive talents dripped with swagger in a way that had no other choice except leading him to greatness. I could see how bad he wanted to win each and every game he played. I could see him change his game at different forks in the road to increase his teammates chances of developing and improve his team’s chances to win. Lillard became a basketball dilemma for opposing teams. Coaches would set a game plan for Lillard and they’d watch him chew it up and spit it out. 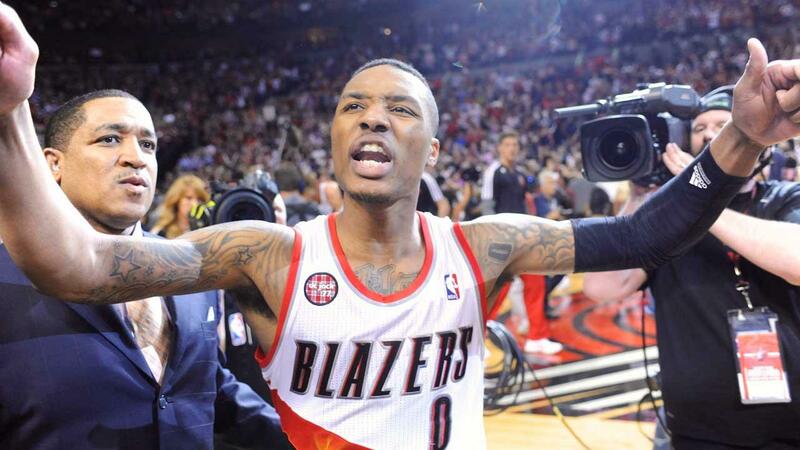 Dame was going bonkers as he instantly became one of the most recognizable snubs in recent All-Star game history. To be honest, I believe what sparked him was sitting at home on the coach watching his ex-teammate, LaMarcus Aldridge, receive praise for his awesome season as he had no trouble at all moving on from Lillard. It was Lillard who was struggling. It was Lillard’s team that was fighting for a playoff spot. I always thought of Lillard as having a gigantic basketball ego and it has been nothing short of the truth. However, it’s what propels Lillard into the top ranks of NBA players. It used to be his greatest weakness as he’d try to do everything by himself, or even fight LaMarcus Aldridge for the top of the Portland alpha dog pole. He has learned how to harness his basketball ego and use it for the betterment of the team. Fuel to the fire. I’ve grown to appreciate the competitive fire that Lillard plays with, but I’ve grown to appreciate the competitive fire that fuels the team more. I didn’t think Lillard and the Blazers had a chance to be anything this season. And by “anything”, I meant anything that was above being one of the five worst teams in the NBA. I should have known better. 26.5 wins. That was the over/under number set by Las Vegas before the Blazers season had started. 26.5 wins was a number that stuck with this team the entire season. It was more than motivation — it was the makeup of their team. The list goes on and on of Portland Trail Blazers who are either unwanted from numerous NBA teams, or players who were highly talented and were never given full respect for their games. The two big names on that list, of course, are Damian Lillard and CJ McCollum. McCollum — the NBA’s 2015-16 Most Improved Player of the Year — is one of my favorite players in the league to watch. In fact, the Portland Trail Blazers are one of the most exciting teams because of what McCollum and Lillard are capable of doing each night. Whether it’s Lillard crossing defenders to thunder home dunks at the rim or McCollum’s ability to generate space for his silky jump shot with unorthodox spin moves and methodical dribbling techniques, their games compliment the other one’s perfectly. When you include the combined 426 made three pointers on a combined .394% it’s almost unfair — as long as you don’t include any conversations about Stephen Curry and Klay Thompson. Lillard and McCollum have been the catalyst for an overachieving 26.5 win team as they’re now the fifth seed wrestling the Los Angeles Clippers with an opportunity to advance to the second round. With Stephen Curry and the Golden State Warriors waiting, the Portland Trail Blazers have the opportunity to defeat the Los Angeles Clippers and get a head start on their next series before the league’s MVP returns from his knee injury. Nobody realistically expects the Blazers to win that series against the Golden State Warriors, with or without Stephen Curry. However, nobody expected the Blazers to be here in the first place, so what do they have to lose? Obviously their best opportunity is without Curry, but they did hand the Warriors one of their nine losses this regular season when Lillard outscored the MVP 51 to 31. They won’t just be playing for fun, or with a “we’re happy to be here” mentality. Anybody who has watched this team at all this season understands that they legitimately believe they have a chance to upset the Warriors and reach the Western Conference Finals. If they didn’t have that mentality, players like Lillard and McCollum would never be in the position they are today. They’re killers, basketball murderers and they’re here to wreck opposing player’s championship aspirations. From this point forward they’re playing for more than just a win each night. Each game the Blazers play they’re playing to prove that they aren’t a fluke, or that they didn’t just take advantage of a surprisingly weaker Western Conference. They’re playing to wow free agents and potentially swing a couple of free agents to Portland this summer. But most importantly, they’re playing for pride. Players such as Damian Lillard and CJ McCollum are continuing to prove they belong in conversations with the NBA’s best, and want to stay in those conversations. After being disrespected by many — myself included — the Portland Trail Blazers are here to finish the job. They’re here to make sure you never forget the season that they’re having. When you go on Basketball Reference in 5-10 years you won’t see that the Blazers topped the Los Angeles Clippers because they were healthier, or that they upset the greatest season in the history of the NBA because they were healthier. What they’ll be remembered for is being the team that nobody believed in. The team that everybody wanted to get behind before it was too late. I went to tons of links before this, what was I thinnikg?